The Virginia Beach prospect discusses his recruitment, and tells the story behind his Virginia Tech offer. Tony Grimes and his father, Deon Glover, had just put the former's eighth grade film online. Their goal was just to get Grimes' name out there to local college coaches, so they could keep an eye on him. So when Virginia Tech assistant Zohn Burden extended a scholarship offer, Grimes was a bit taken aback. "Honestly, it was shocking," said Grimes. "But, it was one of the best experiences of my life. I found out I had an offer after the basketball game, because we had a student-faculty basketball game and I was coaching the students. And after I left, my dad told me he got some good news: that I got the Virginia Tech offer. And that's when everything started to get serious, I was hype. I knew I had to put on my A-game, and I had the potential to go out and be the best I could be." "I just thought, 'Okay, this is a guy to watch,'" said Glover of Burden's interest in Grimes. "But when the offer came I was like, 'Wow!'. I was like, 'Oh my god, I can't believe this, hold on, is it real?!'. And it was real, the entire staff was on board, Coach [Justin] Fuente loved him, he trusted Coach Zohn, and Coach Zohn only recruits the best guys. We [were] blown away." 247Sports rates the 2021 prospect as a 4-star cornerback (93), 12th nationally and 1st in Virginia. The Princess Anne product has received offers from TCU, Texas A&M, Notre Dame, Florida State, Michigan, Clemson, among others. In January, Grimes visited Blacksburg. He and his father, who also coaches defensive backs at Princess Anne, had been plenty of times before. "Well, every time I go to Blacksburg, it's always something new," said Grimes. "When I got up there, I had the chance to meet the coaches, got back on board with Coach [Brian] Mitchell, cause Coach Mitchell is a really nice dude. Not even like football wise, like personality wise he's a really good dude. He keeps teaching me things I didn't even know. I got to spend time with Coach [Justin] Hamilton, he took me around to see the architecture building, which I loved because that's what I want to major in, that or sports medicine. I had the chance to meet the other prospects that may be committing or have committed to Virginia Tech. I had a chance to sit down with Coach Fuente, also." 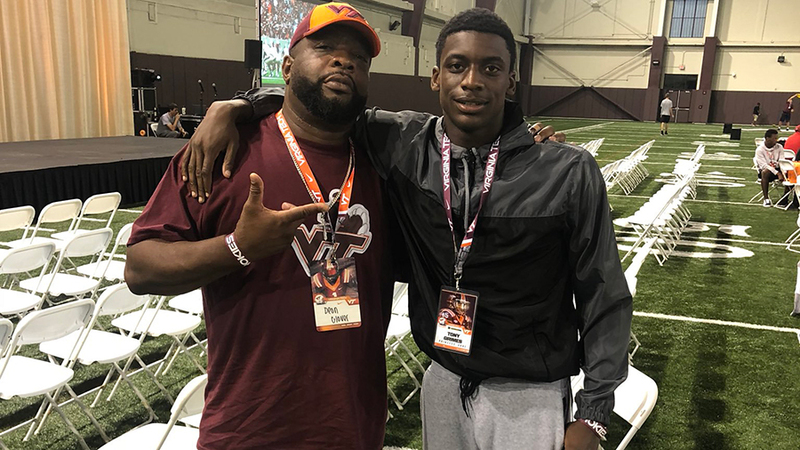 Glover wasn't able to make the most recent trip to Blacksburg, so Grimes and a few other notable recruits were accompanied by Coach Mario Phillips, an assistant at Maury High School and coach of local 7v7 team, Thoroughbreds. "I really wanted [Tony] to be there, [Coach] Zohn really wanted him to be there, and you know Tony wanted to be there," said Glover. "So we were able to make it happen. I was glad because we have a few trips coming up here soon and I didn't want to start the visiting and not start it off with Tech." Grimes left Tech with a good impression of its facilities, a facet of the Hokies' offering that at times has not resonated with other marquee prospects. "They're on a good roll right now," said Grimes. "They're putting everything in place now to make their football facilities excellent. Their football facility is amazing, coming from the team room down to the practice fields. They're redoing their gym, which is gonna be amazing, because they showed us the layout. The locker room is crazy. And visiting the campus, cause the campus is all in the same rock, and it's amazing I kid you not. I loved the architecture building, it was crazy." Grimes' size is the first thing to pop off film. At 6'1", he has the arm length to break up passing lanes without making contact with the receiver. That's led to his coaches keeping him in man-to-man coverage, even with the rest of the coverage in a zone. "We play multiple defenses," said Glover. "We'll run one on one, we'll run multiple defenses. We're excited about Tony's ability, we wants to do those things with Tony, man, zone, blitz. We want to move him around, not just have him on the weekside but have him on the strong side." With his size, Grimes is poised to be a shutdown corner that moves with the opponent's top receiver, a role Grimes embraces. "I know I have the ability to go in man on man," said Grimes. "So when Virginia Tech goes man on man against some of the best receivers, and I'm there and they put me on one of their best receivers, I'm gonna go out there and embrace it and go take it because basically is a 50/50, I got a 50% chance and he got a 50% chance. And I'm gonna go take it. And how they run their defense, a corner like me they can put anywhere on the field, I can go in at nickel, at safety, anywhere." Grimes' versatility is the product of off-season work and self-discipline. Knowledge of how to run multiple coverage schemes, disguise blitz packages, and still being able to develop coverage skills isn't the norm for a high school sophomore. "He has an incredible work ethic," said Glover. "He plans out when he studies, when he trains, when he practices, all that." "Well, it comes from my family," said Grimes of his uncanny work ethic. "Because my dad and my mom, and even my brother, they push me to be the best that I can be. So, even when I'm in bed and it be like, 'get up, time to go run the hills' or 'time to go run the mountain at Mount Trashmore', that's them. But me, as my own person, I have the mindset just to get up on my own and go to do what I got to do." I know highlight tapes highlight the best parts of players but this guy is great for a high school DB. His hip switches are quick, speed to stay with WR, and he's great at finding the ball and reading the qb. We'll take him! Time will tell if he holds true to us. Would be easily the best DB since Kendall Fuller. We've got to lock this kid down, he will almost certainly be a high 4* or 5* by 2021 signing day. Honest question because I have no clue - Do you think he will end up being rated higher than Devon Hunter? He was a low 5*, correct? Also wasn't Kendall one of our highest rated recruits ever? Devon Hunter was a high 4* (.97something), I would not be surprised at all if Grimes was a top 3-4 corner which would likely put him as a 5*. He'll end up being a 5 star, whether he beats Kendall's 0.9923 rating (almost perfect) is up in the air. And Kendall was the second highest rated recruit ever for Tech. Kevin Jones was the #1 overall recruit in the nation in 2001 and was 0.9992, which is tied for the 23rd highest all time by 247. Gotcha. Thanks for clearing that up! I'm not quite up to speed on recruiting history. I wish we could get more Fullers! Is it time for the next generations? I can't even fathom getting the number one overall recruit anymore. ... One day though. Hopefully. So are we on good terms with the Thoroughbreds coaches these days? It seems that way! 7v7 Teams are the new powerhouse private schools when it comes to a recruiting pipeline in 2019, so developing those relationships is gonna be key. Nice to see someone else appreciate Cowgill hall, though speaking as someone about to graduate out of there I wish him luck trying to balance architecture and football. Glad I wasn't the only one that thought, "Ehhh, go for Sports Medicine, kid" but if he really is that well-organized/disciplined, he might be about to do it. He's a sophomore in high school, he probably has no idea what he really wants. But he can have a less time consuming major that's in the same realm as architecture if he goes with urban planning, real estate, construction management, or geography. Yep, that's a biggun, alright. What is this even referencing Lol? That the woman is fat or something? She could play the 5 in Buzz's system. Any relation to Aaron Glover? Former VA Beach LB prospect VT was interested in. Apparently they are half brothers. Thanks, 757to703hokie! Who is the other CB that we are supposed to be chasing? Keep hearing "in the running for 2 5 star corners in 2021". FWI. I would love to get back to lockdown corners. Its been a bit. Isaiah Johnson(?) was mentioned as a potential 5* target that we had a chance with from WV. That said, I have since heard he has some attitude/behavioral issues that may have led us to cool on him a bit. And I don't think he will end up a 5* when it is all said and done. Wait so he's *literally* a coach's son? A real cerebral player? First guy in last guy out? A student of the game if you will. Here's to hoping Tech's 2021 recruiting gets grimey. He's going to be an amazing player at Tech.